I recently became aware of this new documentary Hope for Steve about Steve Dezember and his journey with ALS. I should say the journey of both he and his wife Hope, who accepted Steve's marriage proposal two days after he was diagnosed. Their story is heartbreaking, inspirational, and also a testament to the power of love. Recently, a good friend of mine lost a close friend to ALS as well. This disease is devastating. Please keep an eye out for Hope for Steve and help spread more awareness. Let's find a cure for ALS! To learn more about Hope for Steve and the Dezembers' mission, please visit their Facebook page or website. In the meantime, here is a trailer for the film and more about the Dezembers story below. "Let's cherish every day" and "Beat this disease"
Hope was working as a mental health therapist when she started dating Steve Dezember, an engineer recruiter, after connecting through mutual friends. The two dated for just six months before Steve, only 28, was diagnosed with ALS, a terminal and progressive neurodegenerative disease (also known as Lou Gehrig’s Disease). ALS affects the nerve cells in the brain and spinal cord and has no treatments or cure. ALS progressively robs those affected by causing muscle weakness, paralysis and, ultimately, respiratory failure. The average lifespan after diagnosis is two to five years, according to ALS.net. Two days after receiving this devastating blow, Steve proposed to Hope. He told her, “I know this is going to be hard and you don’t have to stay. But if you do, I want you to be my wife.” Without hesitation Hope accepted and the two were married two months later. Wasting no time, Steve and Hope honeymooned, went on a cross-country road trip and crossed other things off of their bucket list. In the midst of everything going on, they wanted to share their experiences in hopes that Steve’s journey could possibly change the course of the future of the disease. Long story short, what was originally going to be a 15-minute informative film about ALS catapulted to a full-blown documentary called “Hope for Steve,” as the whole town of John’s Creek, GA wanted to help. Thanks to support of the town, the film was completely funded through Kickstarter, which raised $35,000 in 15 days. 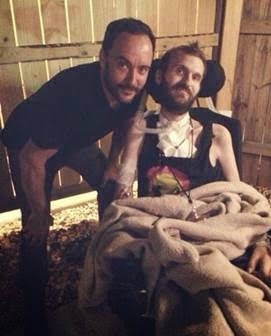 Everyone from the Dave Matthews Band (who has granted rights for his music to be used in the film and invited the couple on stage at a recent concert) to Michael Franti (who has become a close family friend) wanted to get involved. 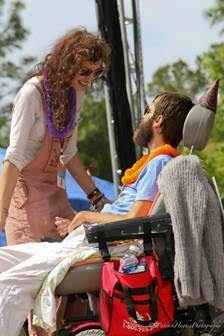 The documentary follows Hope and Steve from 1/2012 to 4/2014, and shows the highs and lows, from Steve dancing at his wedding to shortly after, when he is mobilized in a wheelchair. Aside from the couple’s mission to raise awareness and help find a cure or treatment, the documentary shows this couple’s love for each other and how it quickly overshadowed the disease. Hope's response to seeing a film about her and her husband: "Anxiously awaiting the movie we all get settled into our seats. Now Steve & I have only seen a rough version of the movie before this day, so we were very ready to finally see the finished project we have all worked so hard on. From the moment it starts, I have butterflies in my stomach and cannot sit back. I hold tight to Steve with a handful of tissues ready. The tears start right away, and as I find myself focusing on wiping Steve's tears away I am able to catch glimpses at the audience wiping away their own. Hearing the audience cry, cheer, laugh, and chant with our documentary is a feeling unlike anything I've ever felt. It was a moment that I will replay in my mind over and over. That kind of feedback is what you want from your audience."